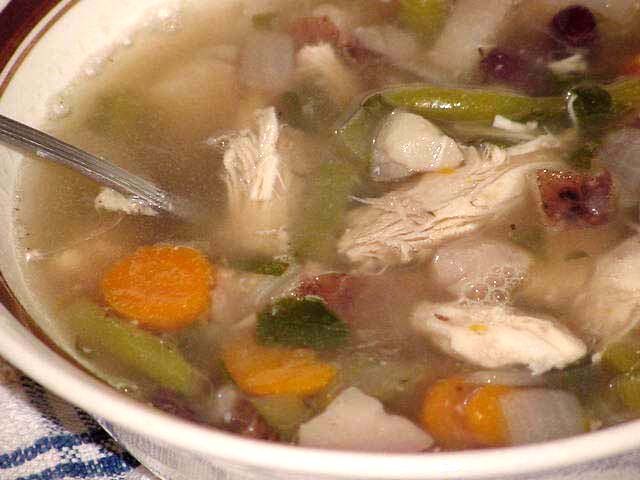 I'm finally getting around to writing about that chicken soup I made the week before last. It's long gone (except for what's in my freezer waiting to go to my friend). The joy of chicken soup is that you can pretty much put whatever you want into it and it tastes good. There are a couple of things that it must have: onion, carrots, and celery. And then there are the things that are important, although not absolutely necessary: beans, potatoes and barley. This soup has all those things, and some green beans too. I didn't want to overdo it because sometimes I get carried away and there are too many things going on in the bowl. I used some fresh sage and a little bit of thyme; that with some salt and pepper is pretty much it. It never looks like much right after it's finished, and it always tastes kind of watery to me. I was a little worried about whether or not I should even save some for my friend. But after the flavors have had a chance to blend and settle overnight, it always tastes delicious. 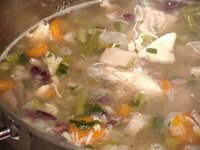 I don't really have a recipe for chicken soup. It's more of a process. First, I put the stock in the pot with the longer-cooking vegetables like carrots, potatoes, and onions, bring it to a boil, and let it simmer for about 10 minutes. I don't want the carrots to get too tender at this point because I want them to hold up during the entire cooking process. 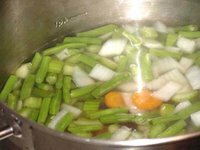 Next I add any other raw vegetables, in this case green beans and celery, and let them simmer for about 10 more minutes, until all of the vegetables are just tender. This is when I put in the barley. Half a cup of barley is more than enough for most soups and stews. 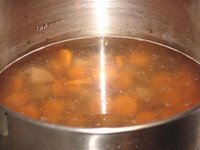 Then I lower the heat even more and leave it on a low, slow simmer for around 45 minutes, long enough for the barley to cook. Last, I add the beans, and anything else that doesn't really need to be cooked, just heated. If I were using frozen corn I would add that now, too. For some reason I decided this soup would be better without corn so I didn't add it. Oh, and I almost forgot--this is when I add the chicken too. It really just needs to be heated through at this point. If you cook it any more it starts to lose its flavor. And that's it. Simple and delicious. That looks great. I have been dying to make soup lately but haven't had the time. I am thinking the first sunday I am in my new place might be soup day.